This week I visited the Memorial to the Victims of Communism, located at the bottom of Petřín hill, Újezd Street in the Malá Strana. The elemental design pieces that created this memorial are quite eye-catching, but yet have an appearance that is sad, mournful, depressing and obviously meaningful. While in the city of Prague, I have learned that the modern art and monuments here can express both internal and societal struggle. During a tour of Prague, I learned that this particular monument was dedicated to the people who suffered under communism. 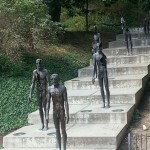 The monument shows seven figures of one man in several states of decay, at different points on a set of uniquely created stairs. Each figure displays a phase of the figure’s gradual destruction in relation to the consequences of communism. As the stairs ascend, the angle of the stairs is increasingly difficult to climb the further the monument goes on. The creator of this memorial did this purposely. The stairs are awkward and uneven, and can be noticed with the naked eye. My tour guide explained that the stairs were built with a much different angle than those of regular stairs. Climbing the stairs forces a pedestrian to experience something unexpected, an intentional uncomfortable feeling. 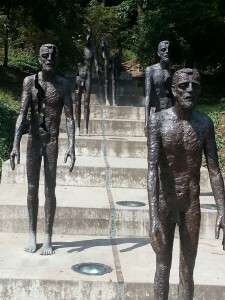 This combination of the unique display of the figures and the awkward staircase made for a very powerful and moving impact on visitors, both symbolically and visually. The tour guide explained that with each phase of the figure, the decaying process worsens as the stairs climb up the hill. Further up the stairs, less and less of the figure appeared. The image of the man lost limbs, broke apart and was left open. 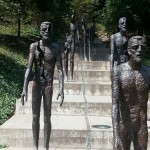 The deterioration of the figure’s body represented the the effects of communism on the Czech society and its people. 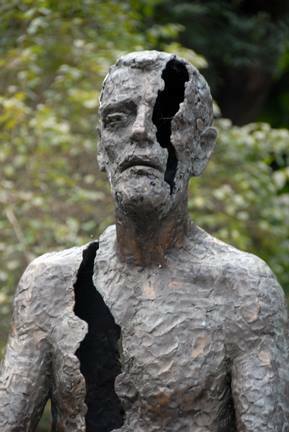 The crumbling figure demonstrates how both the mind and body suffered under communist rule. It is said that the image of the man disappears as the Czech society lost the freedom of thought and expression, while under the watchful eye of the secret police and censorship. There is a bronze strip on the staircase leading up to the figures and then carried all the way up through the remaining half of the stairs. This strip embedded into the stairs lists the horrific details of the victims of communist rule. It read “205486 convicted, 248 executed, 4500 died in prison, 327 annihilated at the border, 170938 emigrated.” This text is repeated continually all the way up the monument. Seeing this monument was truly an eye opening moment for me. It was the first time I began to understand what it was that the Czech people experienced living in the communist regime. I was enlightened but yet saddened by this information at the same time. I can’t even begin to put myself in the shoes of a Czech citizen, and what they must have experienced during that time. I began to understand the effects of communist rule on the people of this country. Looking at the depressing figures, I felt sick to my stomach trying to think what this time period was like. Losing freedom of speech and expression truly breaks the human spirit and body down. I can only imagine that their spirits were broken, souls crushed, and futures were demolished. As I stood there for a few moments taking in the meaning of this memorial, both visually and mentally, I was soon slightly disgusted by the passing tourists posing with the figures. Some would stand next to the sculptures in the same stance, others were shaking hands with the figures, while some just posed with huge smiles on their faces. If I, an American tourist, could see that this was an important memorial to not only the Czech people, but all those affected by communism, how could so many other tourists not see or feel the same thing? As outsiders learn about communism from lectures, school books and even documentaries, we learn only about the more tangible effects of communism such as the lack of consumer goods, employment, housing, war, and the totalitarian rule over such areas. However, it is the more human side that we don’t hear or learn about. Unfortunately, history books don’t write of the broken human spirits and the loss of identity experienced under communism. While I will never fully understand what the effects of communism had of the Czech citizens, I do have a much better understanding of the more psychological damage that was done. I am really glad that this memorial was part of the tour that I experienced because I can now take home a better understanding of how communism affected the people of Czech Republic. The Memorial of the Victims to the Communism was constructed in 2002, 12 years after the fall of communism. The sculptor that was selected for his design for the memorial was Olbram Zoubek.